Friday 24th November was graduation day for pastoral care students at Cork University Hospital. 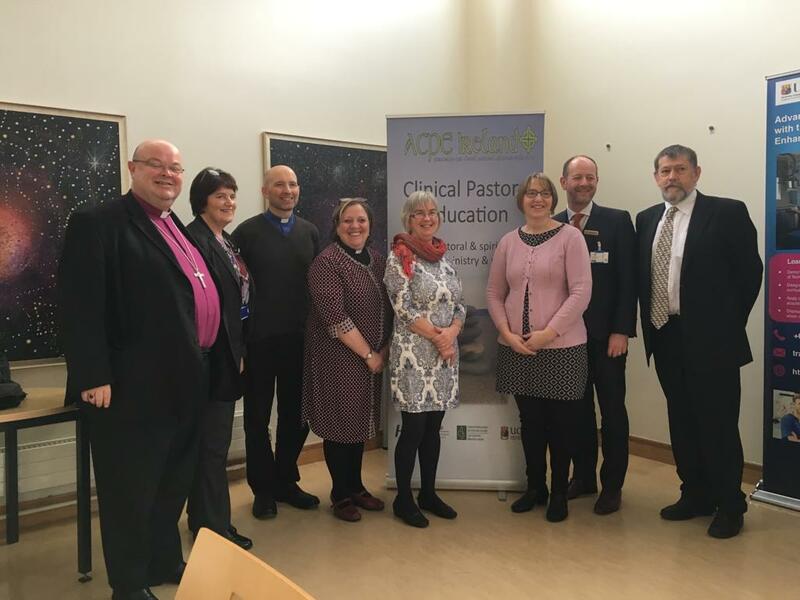 In the Chapel of Christ our Saviour two people from the United Dioceses of Cork, Cloyne and Ross, Hilary Dring (Carrigaline Union) and Sylvia Helen (Kilgariffe Union) graduated with four other colleagues at the end of a very busy twelve week Clinical Pastoral Education Unit. The Bishop, the Right Reverend Dr Paul Colton, attended the graduation ceremony, and congratulated Hilary and Sylvia. an excellent balance between experiential, practical and theoretical learning. It enhanced our personal growth, learning and development as well as our knowledge of pastoral care and chaplaincy. 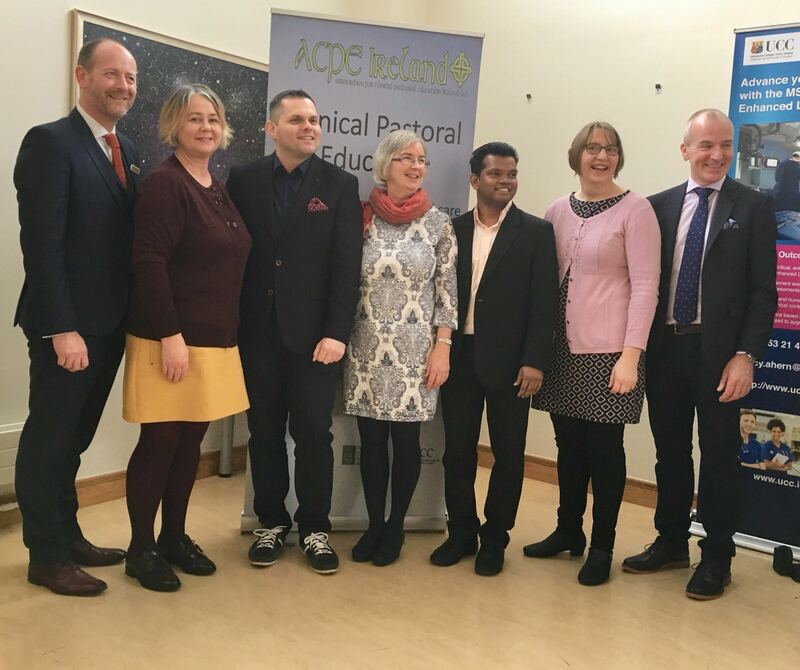 We were blessed with talks and input from multi-faith, national and international lecturers from places such as CUH, Marymount Hospice, Bon Secours Hospital, Mercy University Hospital, UCC, Canada and the UK. We benefited from a wealth of knowledge, grounded in the work people do in their fields of expertise. We shared times of prayer, reflection and learning with the other students and had supervision under the excellent tutelage of Dr. Daniel Nuzum. Placement on wards in CUH enabled us to put all the learning into practice. We visited many different people; some very ill and in hospital for a long time, others maybe only there for the day. Being present with patients and their families in their vulnerability during a difficult time in their lives and being allowed to share in a little of their journey was a real privilege. We were humbled by their courage and resilience and left with a feeling that people are truly amazing. For us it has been a gift and an opportunity which came our way; we are so glad we responded. Thank you to Daniel Nuzum for his leadership and care as supervisor and to the hospital staff for their welcome to us all. The whole CPE process engaged us physically, emotionally, spiritually and psychologically. We had a sense that all the diverse experiences we have had in our lives were coming together like strands of wool, and were being woven into a single thread or purpose. Throughout the 12 weeks we felt we were in the place God wanted us to be. We found it demanding and intense at times but also wonderful, fulfilling and life affirming. It was truly worthwhile. At the CPE Graduation were (l-r): Bishop Paul Colton, Veronica Deane (Cork University Hospital), the Rev. Kingsley Sutton (Rector of Kilgariffe), the Rev. Elaine Murray (Rector of Carrigaline), Hilary Dring, Sylvia Helen, Canon Daniel Nuzum, and the Rev. Bruce Pierce. This entry was posted in Chaplaincies, Clinical Pastoral Education, Continuing Ministerial Education, Cork, Education, Lay Ministry. Bookmark the permalink.